We are proud to present the new ShapeChef 1.3 release, which includes several improvements and bug fixes. You can update by downloading and running the installer from this link. The update is free for all current users. 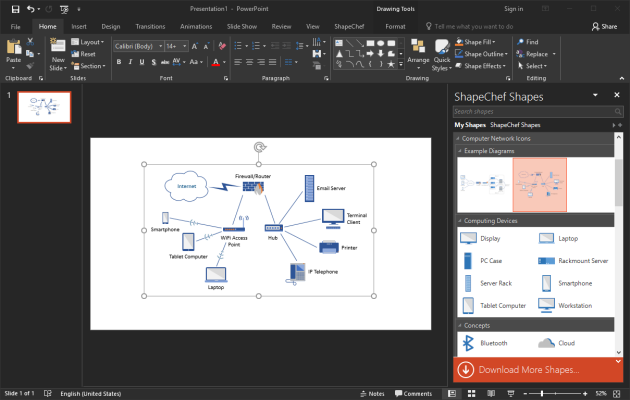 We modified ShapeChef’s user interface so it integrates visually with the new black theme introduced in Office 365. It’s now easier to navigate inside a shape library without using a mouse. When the shape library pane is focused, you can directly jump to items by typing the first letters of the name of a category or shape. We also added shortcuts for focusing the search box (Ctrl-F), adding a selected shape to the slide (Enter or Return), and jumping from an empty search box back to the list of shapes (Esc). Added support for the black color theme included with Office 365. Added the ability to navigate inside the shape library pane by typing the first letters of a shape or category name. Added new keyboard shortcuts: Ctrl-F to jump to the search box, Enter/Return to add the active shape to the slide, and Esc to jump from an empty search box back to the list of shapes. Fixed issue with the “Download Shapes” browser that occurred if “Enable MIME Sniffing” was disabled in the computer’s Internet Options. Fixed problem with ShapeChef being unintentionally uninstalled when using the installer’s maintenance dialog. Fixed incompatibilities with other PowerPoint add-ins (including Adobe Acrobat). Fixed problem with being unable to drag and drop shapes onto a slide. Fixed freezing issue when working with shared shape libraries. Since Version 1.2, we have also added several great shape collections, such as the Flat Color Icons and the Stamps set. Today we released version 1.2 of ShapeChef. Click here to download the installer for this free update. 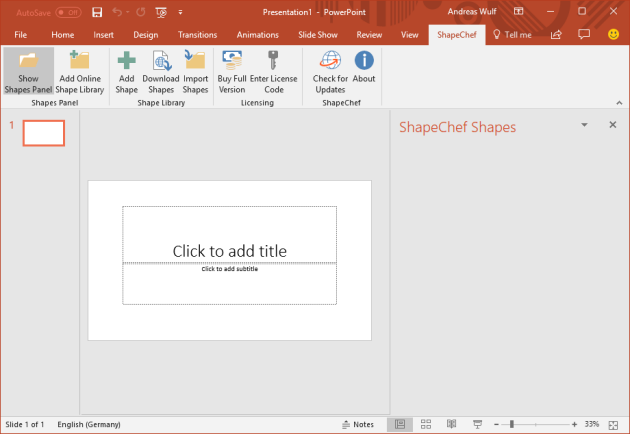 ShapeChef is now fully compatible with PowerPoint 2016 for Windows. In particular, we have added support for the new Office UI themes so that ShapeChef seamlessly blends in with the Office 2016 user interface. 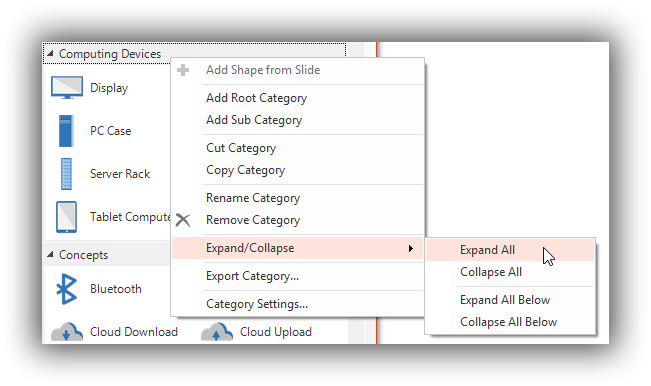 When right-clicking on a category header in the shape library, you will now see additional “Expand/Collapse” menu items that let you expand or collapse multiple categories with a single click. Until this version, the ShapeChef application was installed to the current user’s “AppData\Roaming” (%AppData%) directory, and the user data (shapes, logs, etc.) were stored in the “Documents” (%UserProfile%\Documents) folder. From now on, all ShapeChef-related files are stored under “AppData\Local” (%LocalAppData%). Existing files will be moved automatically when you start ShapeChef 1.2 for the first time. We have made this change to mitigate performance and synchronization problems in corporate environments that use roaming profiles and/or redirect user folders to network locations. 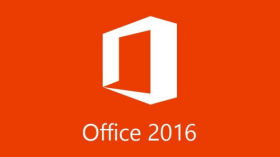 Added support for PowerPoint 2016. Added “Expand/Collapse” menu items for expanding and collapsing all categories in a shape library at once. Improved support for high-DPI screens. Fixed error on systems with enabled FIPS mode. Fixed problem with “Download More Shapes” button being hidden when opening a new document window. 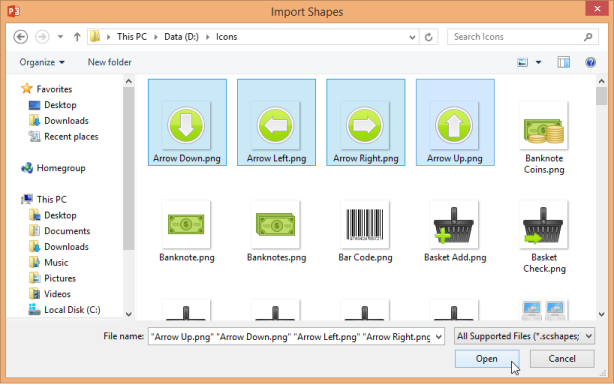 Fixed problem with “ShapeChef Shapes” pane being empty after clicking the “Show Shapes Panel” button. Fixed problem with single quote (') characters in shape and category names. Fixed several minor bugs and annoyances. Version 1.1 of ShapeChef is now available for download. In addition to dozens of bug fixes and performance improvements, the update includes the following major enhancements. ShapeChef’s new copy and paste functionality makes it easy to move items around in your shape library. This works in the same way as moving files in Windows Explorer. 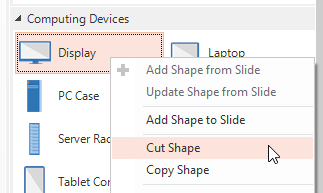 You select a shape or category, right click on it, and select “Copy” or “Cut” from the context menu. ShapeChef also supports common keyboard shortcuts, such as Ctrl+C for copy and Ctrl+V for paste. We have extended the application’s import functionality, allowing you to directly import image files into your shape library. Many common image formats are supported, including PNG, JPG, and EMF. By default, the categories in your shape library are ordered by their names. Starting with this version, you can change this behavior by assigning sort keys to categories. The categories will then be sorted by their keys first and then by their names. Another change is that ShapeChef now remembers the expanded/collapsed state for each category in a shape library and restores it at the next start. ShapeChef Version 1.1 is a free update. Just download and run the installer from here, and enjoy the improvements!